Thanks to all who took the time to share. This year I held my second cookie exchange and it went off without a hitch. I like the ladies to pre-package their cookies because it makes it easier to grab each package and place them in their bag to carry home. It also helps with food allergies. Some of my guests have children with food allergies but would like to take home a package of each cookie baked. They can still take those cookies home with them without a problem. Each package contains 6 cookies. The ladies are very creative with their packaging. Some use tins, carry-out boxes, cello bags, small ceramic jars with lids, small loaf containers, etc. (see picture) It's a lot of fun to see what they will come up with. I give prizes to the top three for creative packaging. Everyone has a great time. This year will be my 5th cookie swap. I have followed your suggestions for invitations, games, etc. I do prefer that my guests pre-package their cookies and it has never been a problem. In my invitation I tell them to send me the type of cookie and/or recipe they will be baking so we won't have duplicates. They are given a date to RSVP by and depending on the number who will be attending determines how many cookies they will need to bring. I have them package their cookies in sets of 6, along with a copy of the recipe. For example, if I have 12 people attending, each person will bake 6 dozen cookies. I usually make 2 different types of cookies. During the swap then, we walk around the tables, and after admiring and commenting on the cookies, we each take 1 bag/package of every cookie except what they have brought. I've asked for copies of the recipes in advance and have actually had little cookbooks made up for that day. It's alot of work but a nice touch. The past 2 years I have asked that the recipe be attached to each package of 6. Hi Robin: I have been cookie swapping with pre-packaged homemade cookies for the past several years. I usually have a total of 16 people at my party. Each person brings 8 dozen home made cookies divided 6 cookies to a package. As we usually don't eat the cookies at the party, this works out best. I award prizes for the most ingredients used and the best presentation or display. I am amazed at the creativity my guests exhibit each year. One winner packaged Pecan Ball cookies to look like snowballs and stacked them in a box with a musical snowman on a sled. The display even had lights! When a guest is unable to attend, they sometimes send their cookies just so they can still swap. Otherwise, the guests can take their "unswapped" cookies back or swap two packages with someone at the party. I do like to have the cookies pre-packaged for the cookie exchange. It's a lot of fun to see how the women choose to package their cookies differently...and also fun to unwrap! The first year I did this I wasn't certain if I would like how they look packaged together on the table...but it's really pretty and festive. I like to host it this way b/c the actual exchange is a BREEZE, clean up is easy and we get longer to gab about everyone's wonderful creations!!! "I get paid to sparkle...you can too!" We just have each guess tell what kind of cookie they made and why they made it. They then go around and hand every one their cookies. Sometimes there are leftovers and they are handed out to whom ever wants them. We swap in prepackaged cookies. We started that way and it has just been easier for us. Some of us don't like certain ingredients to touch so. We tally up how many 1/2 dozens we need and they come wrapped in a cello bag or some ladies have gotten pretty crafty and put them in little tins or takeout type boxes. We are doing it your way this year due to the numbers, however, when we were smaller we did it like this: There were 8 of us total. Each person brought 7 packs of cookies w/half-dozen cookies and a copy of their recipe - the packaging got very creative - boxes w/bows, decorated bags, etc. Each person also brought a small plate to "sample" Every person left with 7 packs of cookies. My cookie party (4th year now) is a pre-packaged exchanged. 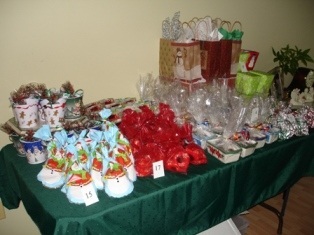 Each guests brings their cookies all ready wrapped and ready to go. There are 6 cookies per package. My friends buy all sorts of fun things to put the cookies in. It is almost a contest in itself- who can find the most inventive way to present their cookies. I do it because we find it easier than everyone having to handle the cookies. only home-made cookies only. No mixes, no refrigerator cookies from a package allowed. First of all, let me tell you how much I enjoy your newsletter! I started a cookie exchange eight years ago, and even though I've moved from that city, the first Saturday in December always finds me on the road for nearly 3 hours to attend! We do the prepackaged method of swapping cookies. We each bring 3 cookies for each person attending. These are wrapped in saran wrap, baggies, etc. Then we each place a container on the countertop and take turns walking around and putting our packages of cookies in each container. Hope that's clear! We also bring an extra 1/2 dozen to put on the table to share as dessert! I give each person 6-12 bags, depending on how many people are coming to the party. They divide their cookies evenly into the bags, either 6 or 12 cookies per bag. They bring the bags to the exchange, we lay them out with the recipe cards in front of them so everyone knows what is in the bags. We all take a bag from each person's pile. I serve appetizers etc so that no one is eating all the wonderful cookies, yet. I find I like this way because then they are all prepackaged and nobody is handling all the cookies while trying to get them divided up. First, I clear out my dining room cupboards to make enough room for each guest to have a shelf to place their prepackaged cookies. It looks like a little country store! After we have tasted the cookies from the table display platters and vote on the "best", I supply all my guests with a large brown paper (or holiday) gift bag and let them go shopping ~ They get to fill their bags with a prepackaged cookie gift from everyone else. Hope this helps!